Already learned the basics? Take the next step and build on your existing SUP skills. Our 2.5 hour advanced stand up paddleboarding skills course teaches you skills and knowledge to safely paddle inland waterways with wind and waves. Skills covered include pivot turns, draw strokes, foot positions, upwind and downwind paddling, edging, bracing, and more! Paddlers will be awarded with the Paddle Canada Advanced SUP Certification, which prepares you for our other SUP skills courses, such as our introduction to river course. This course is also a great refresher for anyone interested in taking a flatwater SUP instructor course or anyone just getting into SUP racing. 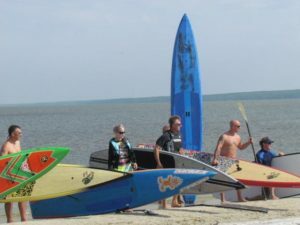 Prerequisites: Successful completion of our Introduction to Stand Up Paddleboarding course or equivalent experience. We provide the technical paddling gear that you will need appropriate to the course as part of your course costs. That means no additional rental fees on top of the course fee.